The Maaaaa of Pricilla: Farm Cat TUESDAY?! It has come to our attention that today is a VERY important day. A day that could not be ignored. It is International Box Day! So we have moved Farm Cat Friday to Tuesday and AbbyDay will be on Friday. Are you as confuzzled as I am? I decided to show this photo of Sherpa in a box on the male person's lap because I think it is funny. Also the publicist is again not feeling well and was too tired to take a new picture. he still spends a lot of time in it. The publicist has it set next to Pumpkin's favorite box in an area of the yurt she calls "kitty city." The male person is NOT amused. 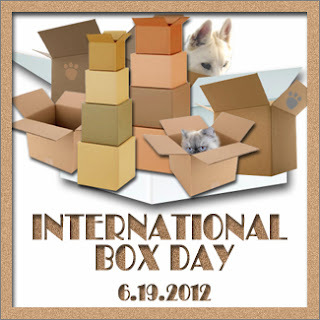 I hope all of you cats out there enjoy your International Box Day. Me, I would rather just eat them.